Iran’s President Hassan Rouhani has warned against the big threat posed by terrorism to all countries in the Middle East and across the world, stressing that support for terrorist groups must end in order to restore regional stability. “Regional stability depends on ending support for terrorism. The eradication of terrorism, restoration of stability and security to the region, repatriation of refugees to their homes and enforcement of the people’s will and vote are among the important and common goals [of Iran and France] on regional issues,” Rouhani said in a meeting with President of French National Assembly Claude Bartolone in Tehran on Tuesday. As a major victim of terrorism, the Islamic Republic is aware of the dangers of the ominous phenomenon of terrorism while France is also now cognizant of this important issue following the recent terrorist attacks in the country, Rouhani said. The Iranian president further urged Tehran and Paris to fully and swiftly implement agreements reached between the two sides during his visit to France in January following the implementation of a nuclear agreement, known as the Joint Comprehensive Plan of Action (JCPOA), between Iran and the P5+1 group of countries. Rouhani said the implementation of the mutual documents would lead to a tangible change in bilateral relations in such areas as politics, economy, culture and science. Iran and France signed a series of basic trade deals estimated to be worth billions of dollars on January 28 during the historic visit to Paris by the Iranian president. Rouhani and his French counterpart, Francois Hollande, oversaw the signing of the agreements, which concerned cooperation in different economic sectors such as aviation, car manufacturing and oil among others. The top French parliamentarian, for his part, said Iran and France should make efforts to fully implement all agreements they have previously reached. 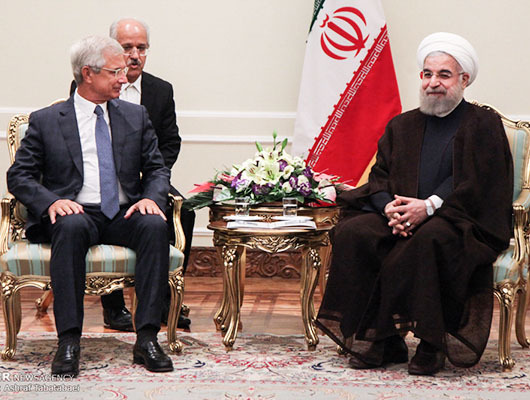 He added that his country supports bids by big French banks to cooperate with and invest in Iran. Bartolone said Iran plays a leading role in reinforcing stability and security in the region and added that Tehran and Paris have common views on many regional and international issues and can cooperate to solve problems. He also emphasized that the campaign against terrorism requires the collective effort and resolve of all countries.